Facebook – you either love it or you hate it. No matter how much some people might hate this social networking site, though, there is no denying that it can be addictive. And, for those who are so into it, there’s no stopping them from being online practically all day. Even those who are certified Facebook addicts have to admit that the social networking site has its downsides. Its applications, for one – they are so many and more often than not, useless and irritating. I have to say, though, that there are some Facebook apps that are useful and actually make sense. Let’s take a look at three apps – two I would recommend to any friend, and one that I need advice on. As the name implies, it’s all about books. In this day and age where watching TV shows and movies (or listening to music) is considered more convenient than reading a good old book, it is refreshing to see an app about books. 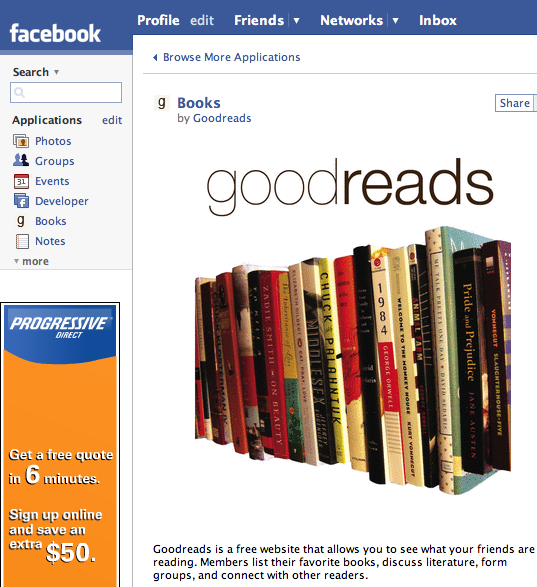 Good Reads helps you keep track of what you have been reading, together with your friends. As with other Facebook apps, the joy is in sharing. You get to rate your books and write your thoughts about them; and then you can share ideas with friends. Call it a virtual book club if you will. 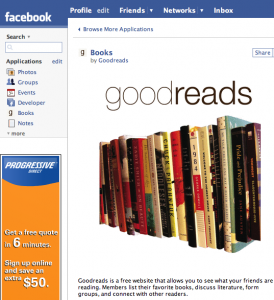 There’s a similar Facebook app called Visual Bookshelf, which I actually use more often. The idea is the same, although there are fewer users than Good Reads. For people who like to travel, there is no better app than this. (If you find one, let me know!) Organize trips and share photos, experiences, and more using this app. You can tag your real life travel buddy; reminisce about your past trips; and plan your future adventures together! This last app, I am still thinking if I should use or not. The premise is very attractive – meet people who can teach you a foreign language, and share your own language as well. I am unsure about the privacy issues, though. Does anyone use this app?